Oh my, poster collectors, are you ready for this? Yes, it's another new Mondo print, but this time they went to the master of poster art himself - Drew Struzan. The Alamo Drafthouse and Mondo are running a Summer of 1982 screening series, recapping one of the greatest summers in cinema history. 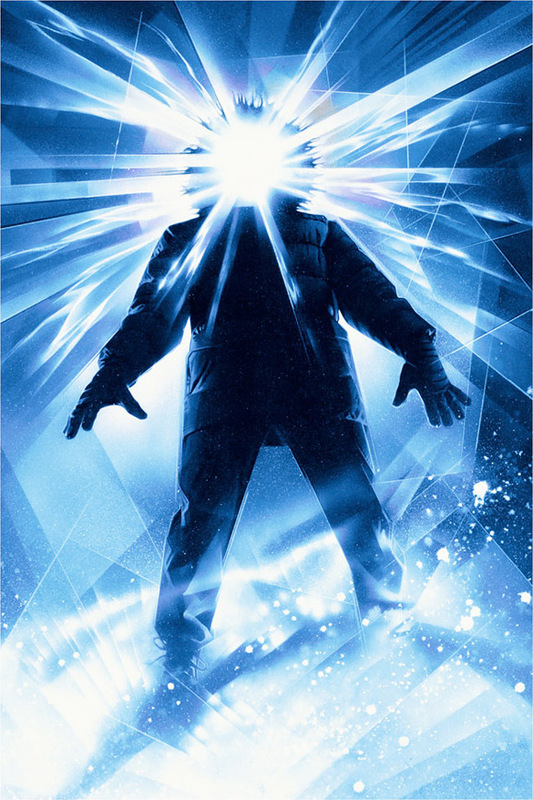 Coming up this very weekend is John Carpenter's classic remake The Thing. Back when this was released, Struzan did an original print for the actual poster. Now Mondo is reprinting that artwork in its clean form - no text, taglines, names or anything, just that great Struzan art in 26"x38". How jealous I am of everyone in Austin. Here's the full design posted on Movies.com today leading up to Friday's event. Looks glorious, doesn't it? All of these are being screen printed in 26"x38", and Drew Struzan has personally signed every last one of them. If you're not in Austin attending the Summer of 1982 screening this weekend, any extras will be sold online at a later date. For more information and for a fantastic interview with the one-and-only Drew Struzan on his art career, Hollywood work, and The Thing, visit Movies.com. "You talk about The Thing and I absolutely remember sitting at the drawing board and posing for the reference material. I remember the phone call, but I wouldn't remember the year if we weren't sitting here talking about 1982. I've spent most of my life standing two feet from a drawing board, because that's what I did. Hard work, you know?" Ugh. Now they've sealed their fate as the least original "art" makers in the news. 'I've spent most of my life standing two feet from a drawing board, because that's what I did. Hard work, you know?' pay attention, today's pasters, tracers and blue/orange wasters. as if to hammer home this point, also from the linked article: 'I got an email from Universal and they said, "We're doing The Thing again, only this time it'll be a prequel. Would you mind if we sort of just copied your original art from the '80s on the computer?"' and they say originality is dead. Goddammit. I love this movie. I still haven't seen the prequel. Been meaning to, just haven't yet. I liked the idea of the prequel, I think it would be interesting to find out the story of the other camp, but everything I've heard about it was negative. I'll probably netflix it soon. As far as sequels, nah. Right on. If they do make more sequels, I'll be interested, but apprehensive. There's another interview with him over here too.http://sidebar.typepad.com/my_weblog/2007/09/the-quiet-giant.html Jim's words are on the money.